In 1964, Ned Jarrett joined team owner Bondy Long and with the support of Ford won 15 times (one of which was with Charles Robinson) but lost the championship to Richard Petty. Jarrett picked up his first superspeedway win, at Atlanta Motor Speedway. In 1965, Jarrett became a star when he won 13 races and another Grand National championship. He placed among the top five in 42 of the 54 races that he ran. 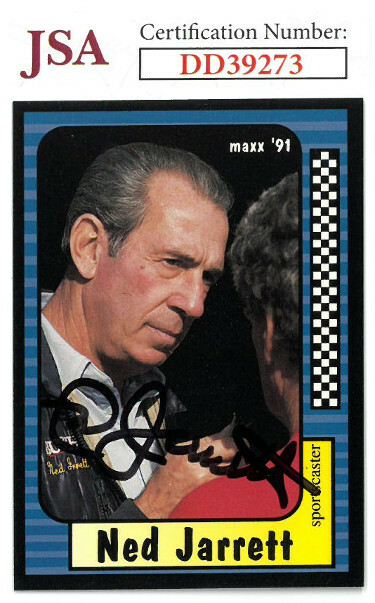 Ned Jarrett has hand signed this 1991 Maxx Racing Trading Card #227. JSA Hologram #DD39273 and Certificate of Authenticity.